» Do cordless anti-static wristbands work? Do cordless anti-static wristbands work? Do cordless anti-static wristbands actually work? I'm starting to suspect that I might have fried a couple of chips with static electricity (got a new central air conditioner last month, and for the first time the humidity in my house is actually below 35% on a regular basis & I've been getting shocked just from petting my cat), so I'm shopping for something to solve the problem. Assuming they actually work, the cordless wristbands would be nearly ideal. 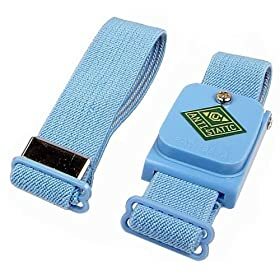 Alternatively, does anyone have an opinion about antistatic chair mats, or antistatic desk mats that are ALSO resistant to soldering iron damage? The chair mats seem like a convenient alternative, but it occurred to me that my DESK wouldn't be in contact with it, and there would be several layers of insulators between it and my body (shoes, clothes, plastic wheels on chair, etc). I use one with a cord, but I stick it around my ankle so it doesn't annoy me.. I have the ones with the cord connecting to it via a clip on button, so when I get up and run to bathroom I don't bring the whole desk with me. I am skeptic about this cordless anti static thingie, I mean where will the static discharge? IIRC they radiate the energy in HF-form. So there must be a battery in it to drive the oscillator. If the RH is low, I wear a wired one. Because I don't trust such a wireless. For home use you can just touch a grounded object. For example a grounded chassis on a piece of test equipment or power supply (grounded through 3rd prong on AC outlet, which I verified is hooked up properly). When you walk up to the bench you can touch it and you'll be fine with typical Si ICs. If you're dealing with GaAs FETs or something ultra-sensitive like that then I always use a monitored ESD strap or I don't shuffle my feet after manually discharging. Btw., they even admit on their website these thingies don't work "as claimed". I read here on AVRfreaks that the cordless kind work by discharging into thin air. I guess it has sharp needles inside (charge likes to accumulate on sharp things like ends of the needle and enough charge creates enough voltage so it just ionizes the air). I think I have never used wrist wraps, but we do have ESD mats on table. In previous life, we also had ESD shoes and chairs, but that requires an ESD floor too. ESD mats and straps are just connected to earth ground via 1Mohm resistor. Just buy 1Mohm resistors and some black wire and you are good to go, connect the wire to yourself and something conductive on the table (tin foil with ESD bubble wrap on top, you can change the bubble wrap when you have poked enough holes to it with your soldering iron). Which reminds me, you should also ground your soldering iron. However, I don't think I have ever killed anything with ESD. I have killed chips and stuff much more often with potential difference by for example connecting ungrounded devices together with a cable - or a grounded and ungrounded device. Home bench: I haven't used a strap in years. But I do touch the metal case of my power supply whenever I sit down at the bench. It is now a habit, like putting on a seat belt when I get into the car. I also have a grounded soldering iron. The last device I zapped with ESD was a small board, uC, Bluetooth module, LCD display, all soldered to the PCB, but no case. I picked it up a zapped a column of pixels on the LCD :( I was away from my bench and had walked across the carpeted floor. Expensive mistake. I doubt that. It's more likely they use a very sharp point to radiate static away as a coronal discharge. I am always amazed by things that I dismiss as impossible turning out to be possible. (ie Static discharge without ground contact). In 30 years of dealing with devices of various families I have never blown anything up. Even when the air is extremely dry. ( Mid winter -20C ). I do however work with a guy that has more body hair than mother nature could possible have intended for a human. He has blown up every electronic watch he has ever worn. He is not allowed anywhere near the assembly benches. He has also started at least two fires that I am aware of. I would stick to a tried and true. Use a proper strap. I will re-do my hair like these guys: no need for a strap anymore in the shack. Nice Pic! Too bad it missed his foot, would have shown his grounding connection. When I worked at a large company and Z80s were strange and new, I had a friend of the feminine persuasion who could stop any machine just by walking too close to it. She could not wear a watch, it would stop in less than an hour. Her job was to check production areas for machinery that needed attention. She would carefully position herself in the middle if the pathway so as not to get close to any equipment and make notes on her clipboard. If an operator noticed anything, they would walk out into the pathway to tell her just so she didn't come close to the machine. Never did find a theory to explain it that made any sense. Must have been and alien. That guy needs no hair-spikes; he grounded himself. I had a friend of the feminine persuasion who could stop any machine just by walking too close to it. Never did find a theory to explain it that made any sense. I can't help but wonder whether there might BE some viable way to actively bleed off a static charge that builds up on somebody. Envision a circuit with a pair of supercapacitors, a MCU, whatever sensor you'd use to detect a charge buildup (hall effect? ), plus some means of controlling and limiting current flow (a gate + resistor?). You'd connect it to a ground and "charge" it with a circuit that would massively deplete one capacitor of electrons, and massively overstuff the other with excess electrons. As a charge built up on your body, it would dynamically connect the opposite supercapacitor to your body through some load (heat-generating, perhaps?) and modulate the connection (pwm?) to bleed it off. Maybe even include a charge pump to forcibly shift electrons from one to the other and keep both as opposite as possible. Conceptually, it seems like something that could work... but the big question (assuming it could) is how long you'd be able to go between "recharges" in normal use. In any case, I did more research on the one I found yesterday. So far, the reviews I've found online suggest that it DOES "kind of work", but HOW WELL it works depends on the relative humidity. In humid environments, it apparently works quite well. In dry environments, it's apparently useless. In other words, it works well when you don't need it, and fails when you need it the most. Update! This review did some fairly objective testing, dissected one, and makes a fairly convincing argument that a cordless ESD protector could theoretically work... but THESE specific devices don't, and almost certainly can't. When NASA approves cordless ESD discharge devices we can know it works. Are you referring to the "tether experiment"? That was the shuttle/orbiter IIRC.